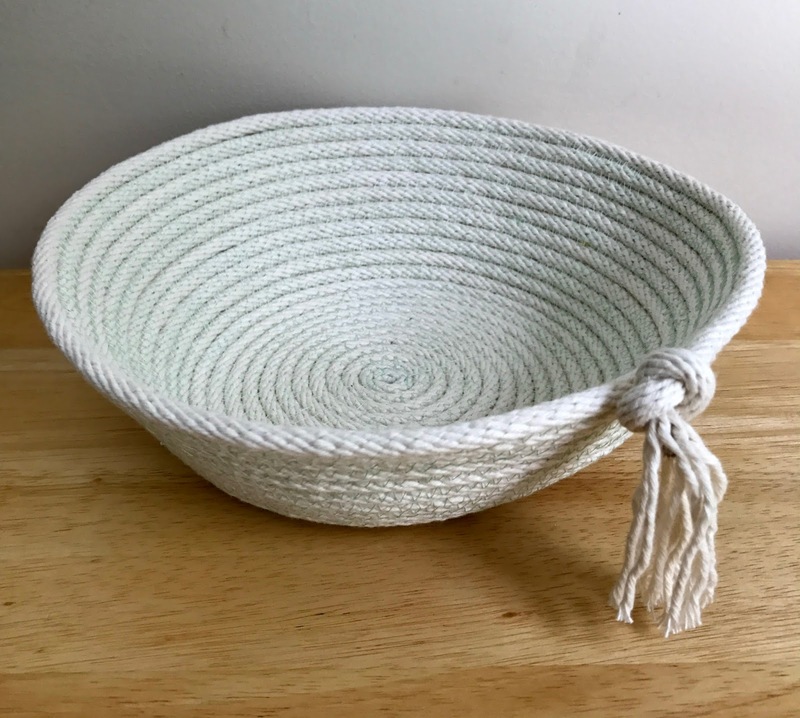 I'm probably the last sewist on the planet but I finally jumped on the Rope Bowl bandwagon. I'm not sure what finally tipped me over the edge, probably the fact that you can't open a design magazine without seeing a room styled with one of these, but here I am catching up to 2014. I'd asked my husband to get me the longest length of clothesline they had because I wanted to make a big basket but then I realized I'd probably be better off starting with something small. Back to the hardware store for a 50 foot starter length. For thread I picked this Aurifil Light Leaf Green (#1147) mainly because I had a fully wound bobbin and an extra spool. 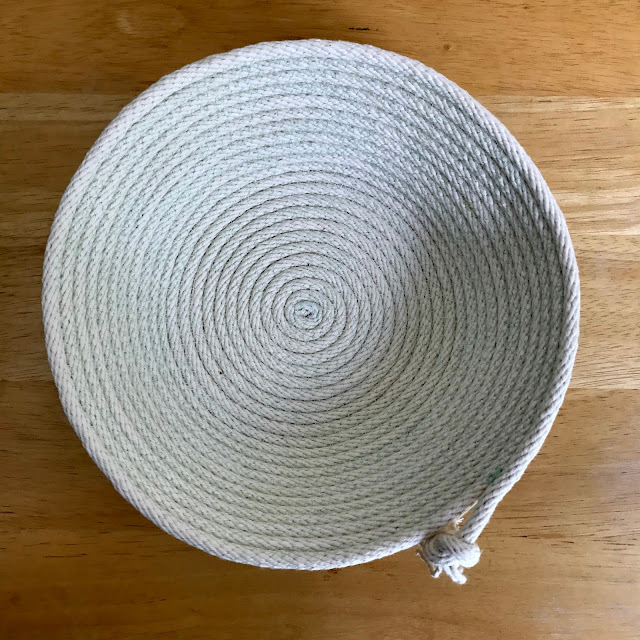 There are a million and one tutorials out there for Sewing a Rope Bowl but I went with Flossie Teacakes because I just adore everything she does. To get some practice I started out making a set of coasters. This was a great way to get a feel for making these because I got to practice lots of starts and ends which really is the most challenging part. 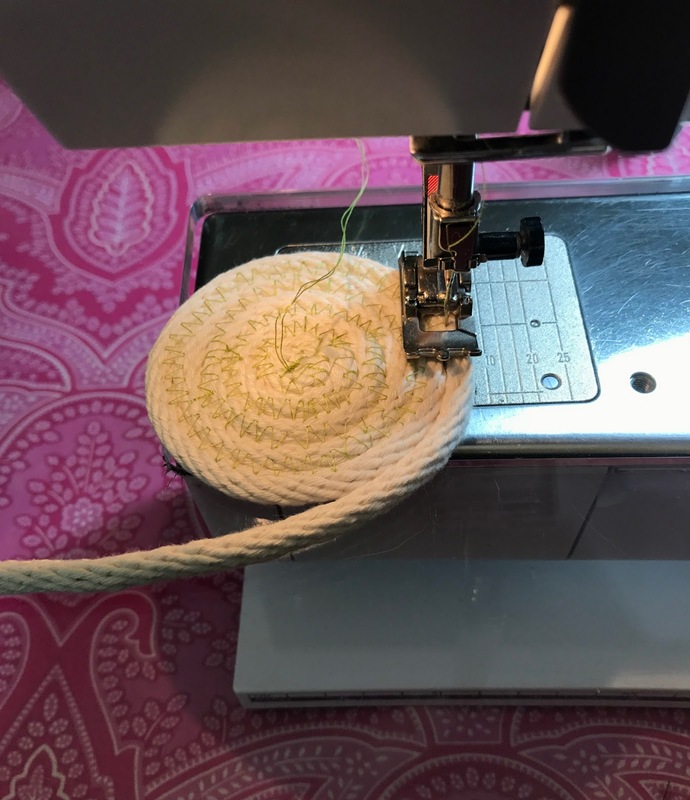 I did find it difficult to get my coil started because my cord immediately started to ravel. What worked best for me was to wrap my end with some scotch tape and then cut the end just above the end. I also saw a suggestion to wrap the end with water soluble thread which would be a great way to use that up as well. I also experimented using different feet. 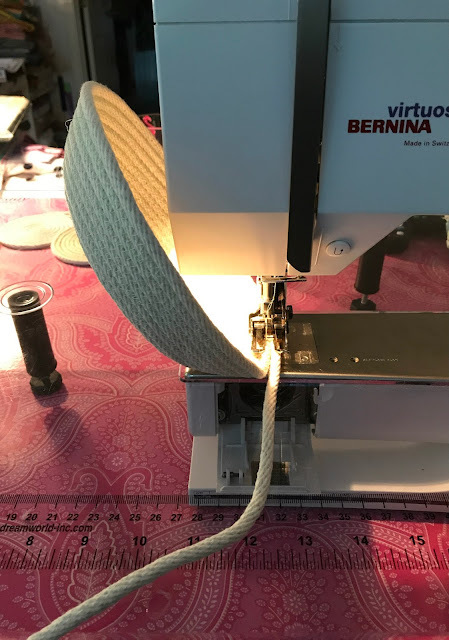 Here I'm using my open toe embroidery foot (#3) but ultimately I found I preferred using my walking foot with the regular sewing sole plate. When my bobbin ran out I switched to Delft Blue (#2730) and made 2 more. I experimented with different ways for ending. I'm not sure I've found one I love but I am pretty happy with the technique of making a loop and then backstitching over the end. 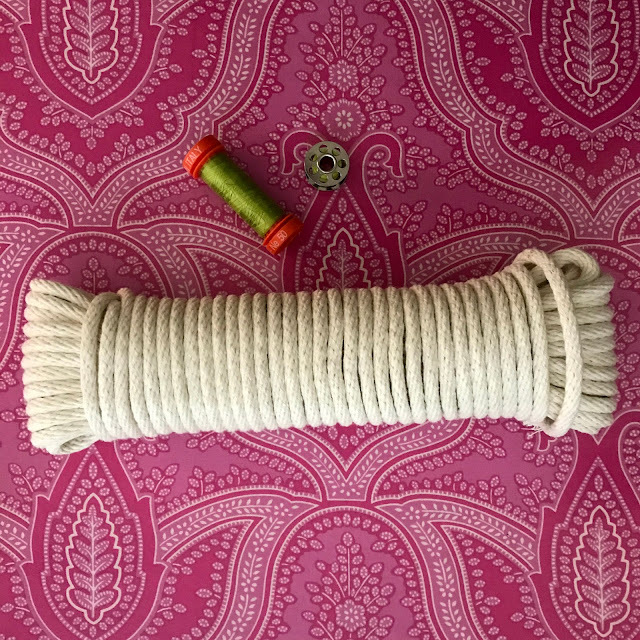 And now for my next project... what's your favorite rope accessory? 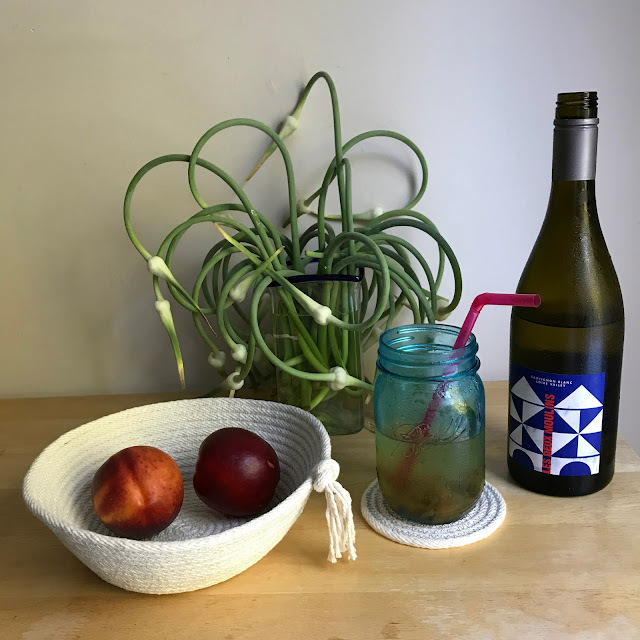 Coastering into the weekend with this week's Finish it Up Friday by Crazy Mom Quilts. I have my clothesline and plan to wrap with fabric. But maybe I should do an unwrapped version to get the hang of it first. Love all your items! 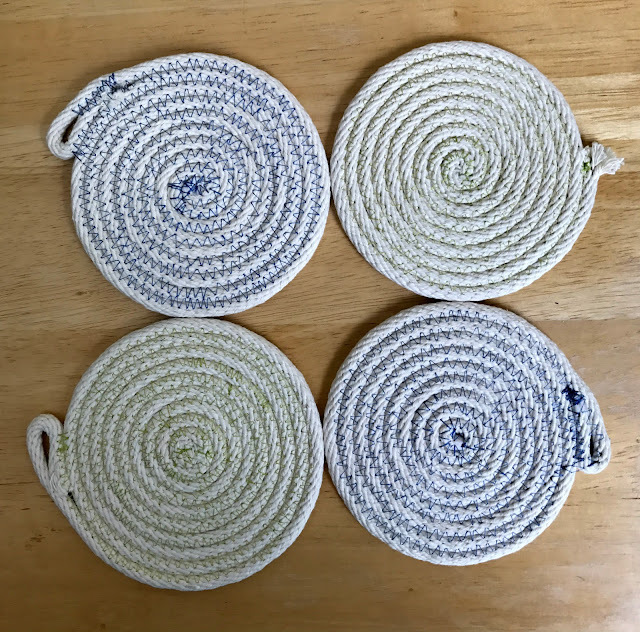 I hadn't thought of starting with coasters, and they are so cute! I love the little knot at the end of your bowl; it adds a fun finish! Well, you beat me to trying this!! Is this hard on the sewing machine? Did you use any special needle? Going to visit the site you mentioned for more info! Your projects look great! !